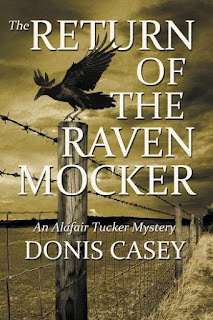 My ninth Alafair Tucker mystery, The Return of the Raven Mocker, was just released in paper and as an e-book on January 3. And yet I’m already working on book ten. When I first began writing the Alafair Tucker Mystery series, I had a story arc in mind that was going to carry through ten books. This is a wonderful idea, but as anyone who has ever written a long series knows, after a couple of books all your plans for a story arc have gone by the wayside. The reason this happened, at least to me, is that I seem to be writing about real people who have their own ideas about how things should be gone about, and once I put them into a situation, they react to it in ways I had never anticipated. So much for a ten-book arc. Besides, I really want readers to be able to pick up any book in the series and have a satisfying experience without having to know anything about what went before. This poses the million dollar question for the author of a long series: How do you keep it fresh? How do you make every story stand alone, yet in its place as well? How do you keep from repeating yourself, or losing your spark? Alafair is a farm wife with a very large family who lives in rural Oklahoma at the turn of the 20th Century. Each of the books features a different one of Alafair’s newly-grown children, with whom Alafair either works to solve a crime, or works to save from him or herself. Since each child has his or her own distinct personality and interests, this gives me a great deal of latitude to explore all kinds of things that people were into in the early 20th Century. For each story I have to figure out a convincing way for Alafair to solve the murder or contribute to the solution, which isn’t that easy for a woman with ten kids! I have found over the course of nine books in the same series that I have begun to depart from the usual mystery novel format. The murders take place later and later in the story with each book I write. The later books are constructed more like thrillers than puzzles. In book seven, Hell With the Lid Blown Off, I told the reader who was going to die in the first sentence, but didn’t actually kill him for a hundred pages. In book eight, All Men Fear Me, we kind of knew who was doing at least some of the killing. But the questions became why, and was there more than one killer? In book nine, Raven Mocker, I immediately start out with the information that we have the wrong guy. I want to mix it up from book to book. I want to keep the readers on their toes. And I want to keep myself amused as well! 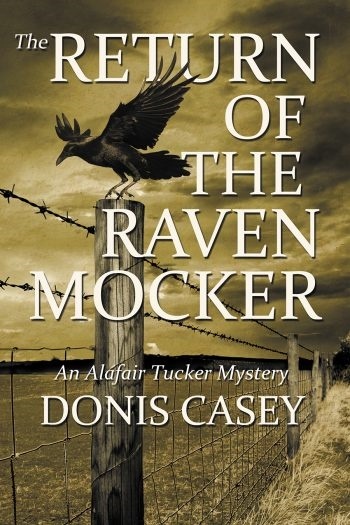 Donis Casey is the author of the Alafair Tucker Mysteries, set in Oklahoma during the booming 1910s and featuring the sleuthing mother of ten children. 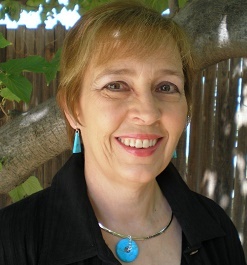 Donis has twice won the Arizona Book Award, been a finalist for the Willa Award and is a seven-time finalist for the Oklahoma Book Award. Her first novel, The Old Buzzard Had It Coming, is currently being offered as a free download on iTunes. The ninth Alafair Tucker Mystery, The Return of the Raven Mocker, has just been released by Poisoned Pen Press. Donis lives in Tempe, AZ. I enjoy reading, and writing, series books, and this was a very interesting post for me. I could relate to your comment about the characters taking over the story and dictating where they want to go and who they are. When a character evolves that way, as opposed to being just the people we may have thought they were, or created via a list of characteristics, they are more real to the reader, as well as the writer. Kudos to you for following the creative spirit. Thanks, Maryann. It's such fun to realize that your characters are much more interesting people than you thought at first. I really love this series - I'm a bit behind though. Must start reading! Thanks for having me today, Dani. You keep reading and I'll keep writing! By the way, besides iTunes, Amazon has now offered The Old Buzzard Had it Coming as a FREE download thru January. Is it safe to assume now that book number 10 may not be the last one in the series?